Prohibition has long been portrayed as a "noble experiment" that failed, a newsreel story of glamorous gangsters, flappers, and speakeasies. Now at last Lisa McGirr dismantles this cherished myth to reveal a much more significant history. Prohibition was the seedbed for a pivotal expansion of the federal government, the genesis of our contemporary penal state. Her deeply researched, eye-opening account uncovers patterns of enforcement still familiar today: the war on alcohol was waged disproportionately in African American, immigrant, and poor white communities. Alongside Jim Crow and other discriminatory laws, Prohibition brought coercion into everyday life and even into private homes. Its targets coalesced into an electoral base of urban, working-class voters that propelled FDR to the White House. This outstanding history also reveals a new genome for the activist American state, one that shows the DNA of the right as well as the left. It was Herbert Hoover who built the extensive penal apparatus used by the federal government to combat the crime spawned by Prohibition. The subsequent federal wars on crime, on drugs, and on terror all display the inheritances of the war on alcohol. 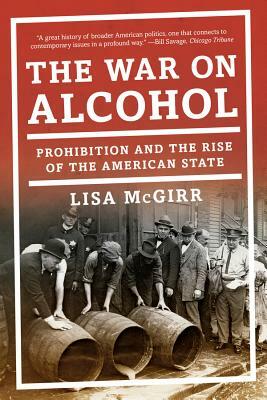 McGirr shows the powerful American state to be a bipartisan creation, a legacy not only of the New Deal and the Great Society but also of Prohibition and its progeny. The War on Alcohol is history at its best--original, authoritative, and illuminating of our past and its continuing presence today.